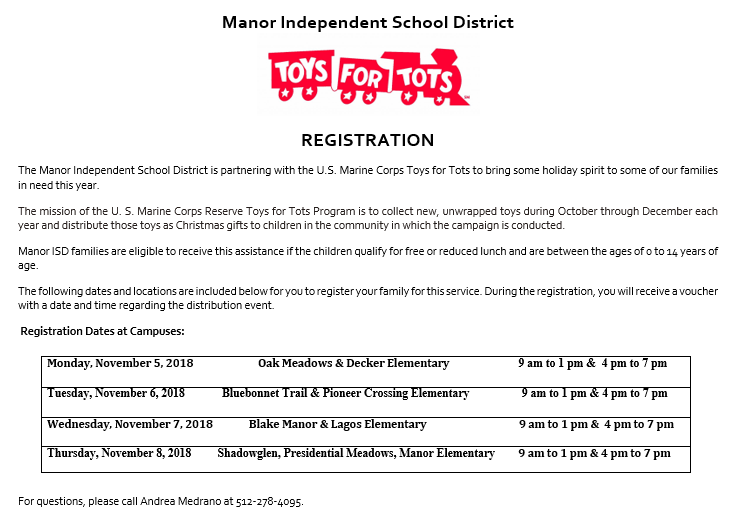 The Manor Independent School District is partnering with the U.S. Marine Corps Toys for Tots to bring some holiday spirit to some of our families in need this year. The mission of the U. S. Marine Corps Reserve Toys for Tots Program is to collect new, unwrapped toys during October through December each year and distribute those toys as Christmas gifts to children in the community in which the campaign is conducted. 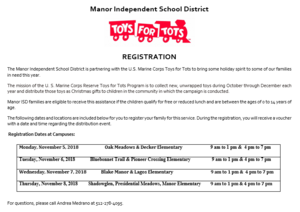 Manor ISD families are eligible to receive this assistance if the children qualify for free or reduced lunch and are between the ages of 0 to 14 years of age. The following dates and locations are included below for you to register your family for this service. During the registration, you will receive a voucher with a date and time regarding the distribution event. For questions, please call Andrea Medrano at 512-278-4095. 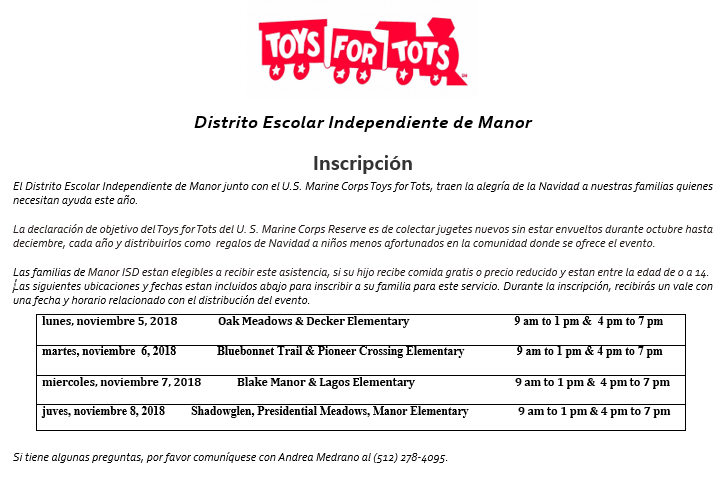 El Distrito Escolar Independiente de Manor junto con el U.S. Marine Corps Toys for Tots, traen la alegría de la Navidad a nuestras familias quienes necesitan ayuda este año. 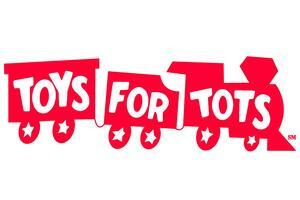 La declaración de objetivo del Toys for Tots del U. S. Marine Corps Reserve es de colectar jugetes nuevos sin estar envueltos durante octubre hasta deciembre, cada año y distribuirlos como regalos de Navidad a niños menos afortunados en la comunidad donde se ofrece el evento. Las familias de Manor ISD estan elegibles a recibir este asistencia, si su hijo recibe comida gratis o precio reducido y estan entre la edad de 0 a 14. Las siguientes ubicaciones y fechas estan incluidos abajo para inscribir a su familia para este servicio. Durante la inscripción, recibirás un vale con una fecha y horario relacionado con el distribución del evento. Si tiene algunas preguntas, por favor comuníquese con Andrea Medrano al (512) 278-4095.